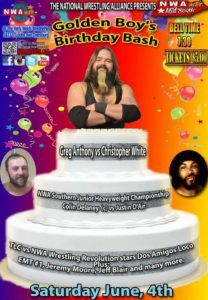 This Saturday night, June 4, NWA Mid South Wrestling will celebrate “The Golden Boy” Greg Anthony’s Birthday Bash! This past Saturday night, May 28, NWA Mid South Wrestling Branch Manager Jon Michael gave Greg Anthony his birthday present a week early when he announced to the crowd that this Saturday night, in “The C&C Pharmacy Main Event”, Greg Anthony would finally get his hands on his managerial nemesis, Christopher White! You’ll also see NWA Mid South Unified Champion Jeremy Moore(@RealJeremyMoore on Twitter), EMT #1, Jeff Blair, & more! Tickets are only $5. The doors open at 6:30pm & bell time is 7:30pm at #TheHerbWelchWrestlePlex, located at 1827 St. John Ave in Dyersburg, TN! Please consider following National Wrestling Alliance & NWA Mid South Wrestling Social Media Director Douglas Hart on Twitter @DouglasHartNWA! You can follow NWA Mid South Wrestling on Twitter @NWA_MidSouth. You can also follow the National Wrestling Alliance on Twitter @NWAWrestling. When discussing NWA Mid South Wrestling on social media, don’t forget to use the hashtag #HistoryIsHere. Thanks for being a fan of NWA Mid South Wrestling! Don’t forget that if it’s not the National Wrestling Alliance then you’re not watching the absolute best in Professional Wrestling!